Sorry this post is so overdue. I've been keeping up with everyone else's posts, but my mind has been in a real funk lately and I haven't felt like writing. However, this post is not about my funk or my lack of wanting to write... 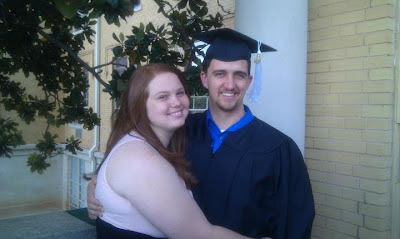 This post is about my husband, the graduate. On Friday, BDR walked across the stage and received his Bachelor's degree from the University of Science and Arts of Oklahoma (where we met). USAO has a lot of memories for us, both separately and together, so Friday's ceremony was bittersweet. 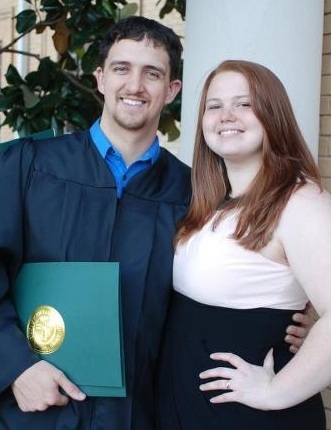 April 23, 2010 (my graduation from USAO), in the classroom where we first met. Over the past two years, while I've been in graduate school, Braylen has been working full time night shift to support us. We are currently a single income family and it's hard sometimes to make ends meet, but God always provides for us, even when we let stress get the best of us. I am overwhelmed by the man I've been blessed with. He is constantly tired, underpaid and over-qualified at his job, and can't focus on his classes as much as he should... All to ensure that I have been able to focus and finish my degree. He is my hero. Without him, I know graduate school would have been near impossible. My honey, hard at work. So, as we step into the unknown (I still don't know if I got that job or when I will have a job.. Or where that job will be) for this summer, I am willing and eager to take on that same responsibility while he finishes his last two classes. I won't say I'm not nervous... It's a lot of pressure to provide our sole income (and this is only the tip of the iceberg on the pressure he must have been feeling for the past two years)!! For how selfish I have felt over this period in our life together, I am that much more excited to provide that same comfort to him: School without the stress of working. Now, back to the graduation (sorry for the tangent!). I expected to cry. A lot. And despite being overwhelmingly proud of him and so happy that he's finally accomplished this huge goal... I didn't very much. I teared up, most definitely... But I get more emotional thinking about it now and what it really means to us than I did when it actually happened. Probably because they just read his name, he walked across the stage, and then the next person was called and the program continued. It didn't last very long, so maybe that's why... My emotions didn't have time to do what I expected them to do. I haven't ever seen BDR look more handsome or proud. I can honestly say, his expression and the way he carried himself was even more proud than on our wedding day. He has been looking forward to this for so long, I can't imagine how good it must feel to bring seven years of college education to a close. As I said, we both have strong ties to USAO, and I am certain that we will still be a part of that college community for years to come. I am so thankful that we have completed our time there, but even now, we reminisce about when we first met, eating at Scooter's (which, now it's not called that anymore apparently), walking around campus, waking up 5 minutes before class started, and living in the same apartment as our best friends. Basically, I am so thankful for that school and what it has brought to my life. It brought me my career, my best girlfriend, my adulthood, and... It brought me Braylen. I couldn't be happier for him and to explore the next step in our journey. I usually save a comment like the following for parents blogging about their kids, but "He's the cutest thing ever"! I know, not really appropriate but would you rather me make up some sh*t? Congratulations to BDR on his accomplishment. And to you for looking awesome at that Graduation!